People who know me say that I’m friendly and hospitable. Often, I’m asked to reach out to others because I have a knack for making people feel safe, cared about and loved. Extending hospitality and compassion to others is always a blessing, but may I let you in on a little secret? The reason I’m able to help others feel so safe and loved is because I haven’t always felt that way myself. However, God has used my past hurts to sensitize me to other people’s pain. The Lord’s powerful healing work in my life has enabled me to minister to other people’s needs! You see, I’ve experienced my share of heartbreak in the past. There have been times when I’ve extended my hand in friendship and opened myself up to people who did not deserve my trust. Later, I was devastated to discover that these were not true blue friends, but fair weather ones who had used me for their own selfish purposes! Have you experienced that, too? I’ve also had close friends backstab and betray me without provocation or remorse. Other people I’ve cared deeply about have disappeared from my life without any explanation! We’ve probably all been through that kind of pain, right? When people rip our hearts out like this, trust no longer comes easily. It takes time to heal from betrayal and a great deal of resilience to bounce back from rejection and abandonment. It’s hard to risk opening ourselves up to the possibility of a new friendship when we’ve been so deeply wounded by our previous ones. But God can use painful experiences like these and teach us invaluable spiritual lessons — ones that aren’t just for us, but that we can share with our families and kids! We each need a great deal of wisdom and discernment when it comes to choosing our friends. God generously gives us wisdom and discernment when we prayerfully ask Him to direct our steps and we study and apply the principles He has given us in His Word! One of the hallmarks of good parenting is genuine concern over the types of friends our children are making. Who are our kids are hanging out with? What they are doing? Do they share similar values? 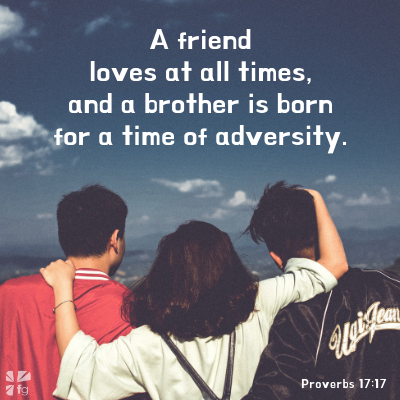 We regularly pray that God will bless each family member with godly friendships and will help us to judge other people the way that He does – not by their outward appearances but by their hearts (1 Samuel 16:7). The Bible teaches us to value others above ourselves (Philippians 2:3). True friends stick by one another through thick and thin – they love one another unconditionally. 1 Corinthians 13:4-8 gives us a clear picture of what unconditional biblical love is all about. Friendship provides us with unique opportunities to support one another, to share our special gifts, talents, skills, resources and knowledge with one another, and to encourage one another and to help one another grow! We grow exponentially as we learn to share the gift of ourselves with one another and receive the blessings that others have to offer us through their friendship. When our children are faced with a friendship that fails, we can teach them that even though people may sometimes abandon us, God loves us unconditionally. He will never leave or forsake us (Deuteronomy 31:6). We can pray with our kids and let them know experientially that when we pour out our hearts to God in prayer, the Lord heals even our deepest hurts! As difficult as adult friendships can be for us to manage, making new friends and navigating childhood friendships is even more complex for kids to handle because they lack the maturity and experience to deal with the turbulence that can accompany even the closest of relationships. One thing that can help children learn about friendship is good fiction where the main characters are dealing with situations that are similar to what they are experiencing in life! For example, Arcade And The Triple T Token – the first book in the exciting, new The Coin Slot Chronicles series by former NFL running back and Dancing with the Stars champion Rashad Jennings – is a humorous and imaginative series that explores the power of friendship and imagination, the challenges in finding your place, and the reality of missing home. If you are looking for a book that will hold both your avid and reluctant reader’s interest (ages 8 and up) due to its relatable brother and sister characters who explore life’s biggest thrills and challenges while solving a major mystery, then this book is for them! What is the most important lesson about friendship that you want to pass down to your kids? Please share your wisdom with us in the comments!